Here’s a sneak preview of the first chapter of Sean Yeager book three – Claws of Time. As you can see, things begin to hot up for Sean, Emily and The Foundation when Darius Deveraux arrives in London and presses on with his evil plans. While I edit, revise and complete book three, please check out the first two books – DNA Thief and Hunters Hunted – which are available from Amazon UK, Amazon US and all major online stores. Also see the website here at: www.SeanYeager.com . For newcomers: In Sean Yeager Adventures, two factions battle each other while shipwrecked on Earth, leaving Sean and Emily to figure out why they are involved and how to find their missing fathers. As events unfold around them Sean and Emily strive to live normal lives and find out clues about their past, present and future. Sean Yeager Adventures are action, mystery, adventures with sci-fi and wit, set on a near-real Earth. They are written for middle grade to young adult readers (8 to 17) and upwards. If you or your children like James Bond, Star Wars, Percy Jackson, Artemis Fowl, Harry Potter or Alex Rider, they will most likely enjoy Sean Yeager Adventures. Read on and find out for yourself… Note: this is an early draft and will magically change during the editing process. A solitary Hyperjet raced across a charcoal sky, tracing an unseen path above a maze of brightly lit buildings and streets. It flew between vast, metal and glass structures, banking and weaving in anticipation of each cloud-piercing tower. The pilot adjusted his control stick and throttle. He fought against a strong, gusty wind that sprayed his cockpit window with horizontal lines of rain and violently threw his craft from side to side. He raised the Hyperjet’s nose to gain height and felt his neck and shoulders press hard into his seat. Wincing inwardly, he spoke into his headset. “Affirmative,” replied Agents Geist and Stafford in unison. The Foundation Agents patted their harnesses and pouches several times with gloved hands, each running through a mental checklist of their equipment. Their Hyperjet levelled and approached a sharp, triangular tower that glowed turquoise in the darkness. Circling briefly, it began to hover and descend towards a gleaming spire, using a red flashing light to guide their way. Captain Shaw, spoke on the intercom. The agents nodded to each other. They rose from their seats and took up positions at either end of the cabin. “Understood Vixen, we’ll be as quick as we can,” replied Stafford. “It’s our lives on the line,” added Stafford. “You don’t say?” replied the pilot. The agents clipped their harnesses to winch cables and waited. A deafening howl of wind and rotor noise filled the cabin. The floor split in two, revealing the flat, glowing roof of the Adastra tower. It was an area no wider than a half a basketball court and was surrounded by angular metalwork. Agents Geist and Stafford stood silhouetted against the city lights and tightened their face masks. They stepped carefully onto winch foot-plates and wrapped their hands and wrists through loops of cord at chest height. Agent Geist swung a short distance across the floor and plummeted downwards. He braced himself against the wind and held tightly to his hand and foot holds. The storm blew him in a spiral and he swung four feet above the roof. Geist leapt feet first and landed firmly on gravel, only a few feet away from a row of blue illuminated skylights. “Geist in position. It’s freezing down here,” he reported, pulling his assault weapon from its shoulder holster and tightening the strap around him. He scanned the rooftop through the weapon’s scope. There were no signs of life, only air conditioning units, some solar panels, a few aerials, a gantry crane and the appalling weather. “Why did we have to pick tonight of all nights?” he muttered, shivering in the cold. Geist stayed low to the ground and crept a short distance across the roof. Geist kept watch over the rooftop, constantly scanning for movement. He peered up for a moment at the noisy shadow hovering above. A dark figure fell rapidly from the Hyperjet’s belly. It jerked to a halt, and began to swing in circles. Geist flipped his weapon onto his back and ran across to help. He grabbed Stafford’s winch plate at shoulder height and steadied it. “Come on Twinkle-toes, show time!” he joked. Agent Stafford leapt from his platform and fell sideways. He landed on a blue skylight. A hairline crack extended from the front of his right boot and forked violently across the glass. Stafford stretched out to spread his weight and slowly crawled off the glass on all fours. He rolled onto the gravel. The two agents waited in silence for an alarm to sound, but there was nothing. Above them, their winch cables rose and vanished into the night sky. “Vixen, we’re down in one piece,” replied Agent Geist. “Stay close, Vixen,” added Geist. Sean and Emily crept into the family room at Kimbleton Hall. A log fire flickered invitingly in a large grate. Above it, on a stone mantelpiece, stood a plain ceramic clock with Roman numerals. It was nearly seven pm. “Wherever you left it silly,” replied Emily, slouching into the most comfortable armchair and lying back with her legs curled up. “Ahh! Where is it?” complained Sean, scouring the room. He overturned scatter cushions in a frenzy and threw them in a heap. “Phew!” he said, finding the controller beneath a purple sofa. There was a creak at the door and footsteps rippled through the wooden floor. Sean hissed under his breath, and hid the remote behind his back. Emily’s mother, Mrs Campbell, entered the room with her dog, Braveheart, bounding along beside her. She was followed by another set of footsteps. Sean grimaced and pretended not to hear. He turned on the TV and selected a movie channel. The film was Raiders of the Lost Ark, one of his favourites. Emily giggled. Mrs Yeager selected a news channel and turned up the volume. The first program was an advert. “Stuff and nonsense,” muttered Mrs Campbell. “It tastes disgusting for a start,” replied Sean. “And it’s full of chlorine and calcium,” added Emily. “Calcium’s good for you, my dear,” corrected Mrs Campbell. Mrs Yeager ignored him and leaned forwards in her chair. Sean and Emily studied the TV screen. It showed a black and white image with two blurred squares. Inside the squares, were some shadowy lines and around them were a group of irregular blocks. “That could be anything,” joked Sean. “So James, have there been any finds at this new site?” continued the anchor man. “More mummies? Don’t we have enough of those already?” asked Sean. Emily sighed, and glanced first at Sean and then towards her mother. “Actually, I’d like to go back to school Mum,” she said. The news program moved on to its next story and showed a home-made video of a meteorite striking a parked car. The car had a huge dent in its roof and exploded shortly after impact. “And this is only one of a number of incidents,” said the reporter. “Why? What happened?” asked Sean. “And what other damage have they caused?” asked the anchorman. “What’s so funny?” asked Mrs Yeager. “We can’t go back to school because a meteorite could flatten it,” laughed Sean. “Why? Is your school in America?” asked Mrs Campbell. “You have the attention span of a gnat, Sean. The reporter was talking about meteorites in America. Okay, you can watch your film now,” she said. “And I’ll make you some popcorn my love,” added Mrs Campbell. Two men wearing full-length, black trench coats entered a dimly lit restaurant. It was situated in a quiet London side-street. Although it was early evening, and already dark, its first customers had yet to arrive. The men studied several rows of immaculately prepared tables and a handful of eager waiters. Satisfied that the restaurant was safe, one man returned to a waiting limousine, while the other held the door open for an older, distinguished gentleman. “I’ll wait here, Sir,” he said. The gentleman nodded, and gave his coat to a waiter. He sniffed at the green ceramic up-lighters and informal décor. It was a bistro at best. In the centre of the room, stood an impressively large aquarium containing a sunken ship. It was brightly lit, in shades of yellow and blue, with constantly rising bubbles. It appeared to contain lobsters with their claws bound. A figure walked towards him. “Ah Minister, thank you for coming,” announced a tall, slim, white-haired man, who reached out to shake his hand. A waiter led them to the best table in the virtually empty restaurant. It was set with glasses, napkins, and a small table lamp. The Minister for Interior Affairs sat with his back to the aquarium, and reached for a breadstick. Darius Deveraux sat opposite wearing tinted glasses. He beckoned for the menu, and offered the Minister a small bowl of olives. Deveraux stretched his pale face into a half smile. “I can tell you are not a supporter of The Foundation, Mr Deveraux?” added the Minister. The Minister accepted a copy of the menu and sighed. He scanned it briefly. The Minister raised his right hand in acceptance. Deveraux nodded to a waiter, unseen by the Minister. From the aquarium, there was a gentle sloshing of water. The Minister looked up with a quizzical expression. The Minister shook his head, and returned to examining the menu. A waiter stood behind them, and flipped open the aquarium’s lid. He appeared to mentally choose a lobster, but looked startled and quickly backed away. He composed himself and approached the Minister. “Are you ready to order?” he asked. The Minister peered over his reading glasses and gave an audible ‘huff’ as he breathed out. Deveraux noticed the waiter’s eyes glow red and nodded to him. “I need another two minutes,” replied the Minister, shrugging as he returned to his deliberations. Behind him, a dark shape slowly approached the front of the aquarium, sending lobsters scuttling in all directions. The creature completely covered the shipwreck with its muscular bulk. It was covered in dark, mottled scales, with here and there a few luminous green stripes. It stretched out and extended several long tentacles above the waterline. Using its suckers it climbed and reached over the edge of the aquarium’s thick glass wall. With a sudden whiplash motion, the creature hurled a lasso-like tendril around the Minister’s neck. The Minister sat bolt upright with a startled look on his face and gasped. His veins pulsed and protruded on either side of his throat. “Are you alright, Minister?” smiled Deveraux. “Feel my pain!” wheezed the Minister, with his eyes rolling upwards inside his eye sockets. The Minister struggled to reply and Deveraux did not wait for a response. He stood and leaned over the table, steadying the Minister’s head with his left hand. The tentacle released its grip and withdrew to the aquarium, as quickly as it had arrived. Deveraux ignored it, and picked up a napkin with his free hand. The Minister groaned quietly as if in a trance, his eyes now shut. Stepping around the table, Deveraux dabbed at a red puncture mark on the Minister’s neck and raised his shirt collar to hide the evidence. Next, he gently lowered the Minister’s head to rest on the table, beside his plate. Deveraux waited a moment, before walking confidently across the restaurant towards the bodyguard. “I think the Minister needs your help,” he called. The bodyguard stopped reading his newspaper and crumpled it in two. He looked disgruntled, as if someone had disturbed his rest. Deveraux spoke calmly. “He seems to be over tired,” he added. “Leave it to me, Sir,” replied the bodyguard, speaking into a microphone inside his sleeve, and glancing across at his superior. By now, the Minister was sitting upright and babbling incoherently with a wide grin on his face. The aquarium had returned to its yellow and blue glow, with red shapes wandering slowly across its gravel bed. A waiter stooped to wipe the polished oak floor with a napkin, while another poured water into a bulb-shaped glass in front of the Minister. Agent Geist unclipped a pouch from his webbing. He opened its cover and selected a cutting tool and a spray can. Geist leaned over the row of skylights. It extended for several paces in a large rectangle, like an ornamental glass pond. Beneath it, he noticed a grid of interlocking metal fins that formed a solid barrier. A faint blue light glowed through some punched holes in the metalwork. “What do you mean?” asked Stafford, inspecting the glass. Geist motioned for Stafford to cut an adjoining panes of glass. Meanwhile, Geist cut a large oval hole. His sonic-cutter squealed at a high frequency, barely audible to humans. Using a handle with two suction cups, he removed the unwanted glass and laid it on the roof, beside a row of heat-exchange units. The rain had stopped, but a strong gust of wind nearly blew Geist off his feet. He crouched and leaned into the storm, until the wind had died down. “So how are we going to get through those shutters?” asked Stafford. “Watch and learn. If this gel doesn’t work, we’re aborting the whole mission,” replied Geist. Geist leaned over the first hole and sprayed a fine gel onto the shutters. The aluminium fins spluttered and fizzed, throwing steam and bubbles of noxious vapour into the night sky. Stafford staggered away and nearly lost his balance. “Of course, that might be an improvement,” chuckled Geist. Satisfied with his work, Geist repeated the exercise on the second hole. “Okay, let’s find something firm to hitch onto,” he said. After several minutes of preparing lines, harnesses and clips, Geist tested their anchor points and nodded. Stafford shuffled forwards and sat on the window frame, with his legs dangling into an empty space. “No signs of movement below,” he reported. Geist sat beside him. A cavernous atrium stretched out beneath them for hundreds of feet. He could just make out a row of elevator shafts in the dim light. Geist felt his heart pounding and checked his harness and line for the third time. Agent Geist cast off into the chasm and whirred down his line, swinging gently as he went. He braked by wrapping his boots around the rope and squeezing with his legs, as the floor approached. Geist landed softly, and quickly detached himself. He took up a position with his back to the wall, and brought his weapon up to his shoulder. Through his scope, he noticed a line of elevator cables and a handrail. Only one of the elevator cars was visible. It was glass-walled and empty. “Quiet as a crypt,” he reported, scanning the rest of the balcony. Geist watched Agent Stafford land a short distance away. “What kept you?” he joked. “My need to stay alive?” replied Stafford grimly. “It’s gonna cost you,” grinned Geist. Geist watched Stafford pull out a sidearm from his thigh holster and check that it was loaded. The building was strangely quiet and even the gale outside was now a distant rumble. “Where’s the night watchman?” asked Stafford. Geist crawled to the edge of the balcony on his hands and knees and peered down into the main lobby. Far below, he could just make out a lone orange spot against a cool grey background. In front of it, stretched a wide, curved desk. “In the land of nod by the looks of it,” he replied. “Vixen, we are in position, over,” reported Stafford. “I copy that,” replied Vixen. Geist rose to a crouched position and scanned each end of the short balcony through his assault weapon’s sight. It had a neatly carpeted floor with fake plants and little else. “Okay Houdini, work your magic,” he said. “I’m on it,” replied Stafford. Geist stood guard, and watched Stafford run past him to examine a door with a long vertical bar for a handle. “Where’s the keypad?” asked Stafford. “Come on, we’re running out of time!” complained Geist, turning around. Stafford scanned the wall looking for signs of heat and shook his head. “Do you have any burn gel left?” he asked. Geist reached into his map pocket and pulled out a pencil-shaped device and threw it to Stafford. The device flashed green, as Stafford swept the wall on the left-hand side of the door frame. “Set your blaster to impulse, should do the trick,” suggested Geist. Stafford fired his blaster at the wall. His weapon hummed quietly, but nothing happened. “More juice,” muttered Stafford, adjusting the power level. Stafford fired again and a short flash emerged from a tiny crack in the wall. A small gap appeared in the textured wallpaper and a square flap became visible. Stafford pulled out his combat knife and prised open the outer casing. “Looks like a manual override,” he explained. Instead, Stafford reached inside the wall box and flicked a switch. The door opened inwards with a sudden rush of air. Geist approached and peered into a dark corridor. “It’s all clear! Come on!” he said. The moment Geist took his first steps into the corridor, another door hissed open a few strides ahead. He raised his weapon, fearing the worst. But he was too late, Geist passed the inner door, and began to scan the interior. Geist crept forwards, and switched his helmet scanner to sense heat and movement. The room was dark and full of dense vapour. He noticed a cold, blue pattern on his headset, but no sign of activity. “And it stinks of chlorine. What is this place? A swimming pool?” he complained. Geist inched slowly forwards through the fog, and heard a dull metal ‘clang’ beneath their feet. “What was that? Did you drop something?” he asked. Stafford, turned towards him, with his weapon and visor glowing bright red. Agent Geist noticed a tiny flash of red light at ankle height on his left. Stafford took a step towards the beam. The inner door slammed shut behind them and hissed. It was followed by the howl of overhead fans. Soon, the fog began to swirl around them. Geist turned to his right. On infra-red he noticed a distant orange spot, it was joined by a second, then another. A row became visible, then a second row. He flicked his headset to ultra-violet and his stomach sank like a lead weight. Geist realised in horror that they were standing in a vast gallery, four floors high that stretched as far as the eye could see. Each floor held several rows of stands, and each stand held a dark figure wearing a mask, tubes, and a combat suit. Stafford stood with his weapon raised. Around him, a pale orange glow illuminated the clearing fog on all sides, and a series of dull thuds echoed through the gallery. Geist peered into the mist and saw the distant outline of a dark figure. Behind it stood another. One by one, the figures moved, with their eyes shining red. His infra-red sensor glowed with a patchwork of heat patterns, changing from pale yellow to orange and then crimson. I hope you enjoyed Chapter One of Sean Yeager Claws of Time (book 3 in the series). Please stay tuned for more news about Sean Yeager books. Books One and Two are available from Amazon UK and Amazon US in print and e-book formats. Book Three will be ready in 2017. This entry was posted in adventure book, artemis fowl, book series, books for boys, children's book, great new book series, james bond, middle grade, percy jackson, science fiction, sean yeager, sean yeager adventures, Uncategorized, young adult and tagged #alex rider, #chapter one, #free chapter, #scifi, adventure book, artemis fowl, book for boys, books, children's book, children's book series, great new book series, harry potter, james bond, middle grade, percy jackson, sci-fi, sean yeager, star wars, young adult on July 25, 2016 by D.M. Jarrett. Well it had to happen, our son has read all the Harry Potter books and we’ve been searching for other great book series. In no particular order here are 5 great book series for middle grade to tween readers. (I have omitted Young Adult titles deliberately). Obvious really. If the first three books don’t grab your child’s attention I guess they don’t like Harry Potter. Stand by also for the comparisons and proclamations of the things not in the films which are better presented in the books. Strangely the shorter books were voted the best by our son, perhaps they were better edited? Now you do need to allow your child to settle with the idea that Greek and Roman myths have been ‘borrowed’ and transplanted to the US. (Not my idea of plausible I have to say). Apparently the books are an easy and exciting read with lots of action. I would add that they seem to be easily read in next to no time. Good news for the author and publisher, not such great news for the parents asked to buy the next book in a matter of hours. Perhaps a push for middle grade and pretty heavy in volume. We started with The Hobbit and it was very well received. A budding fan is born. I await the film and book comparisons. LOL. Given the length of both that could be some years away. Fast paced, exciting and full of ideas. Our son and several of his friends have been up all hours reading and re-reading books one and two. Be prepared for an explosion of ideas, designs and follow on stories. Apparently these books are non-stop boys own adventures with all the details added in. Useful if you are ever stuck in a jungle and need survival skills. If only there was an episode for commuters and office workers. Technically this is the sixth book series, though I did say ‘after Harry Potter’. We have had a mixed reception with this series. Son loves the action and humour, he’s not so keen on the faeries. Nonetheless a worthy addition to our humble book series list. Lots happens and there are plenty of books in the series. So there you have it parents, grand parents, aunts, bloggers. We hope you find this list of book series useful when seeking purchases for the children in your life. This entry was posted in action book, artemis fowl, book series, books, books for boys, boys' booklist, children's book, fiction, grandparents, great books, great new book series, harry potter, inspiring children, james bond, middle grade, moms, mums, parenting boys, parents, percy jackson, reading, science fiction, sean yeager, sean yeager adventures, star wars, teen read, tween read, Uncategorized, writing for boys, young adult, young fiction and tagged 5 great book series, artemis fowl, bear grylls, best book, book for boys, book series, books, books for boys, children's book, children's book series, children's learning, children's play, dads, down time, favourite book, grand parents, harry potter, james bond, middle grade, moms, mums, parents, percy jackson, reading for boys, sean yeager, sean yeager adventures, star wars, the hobbit, young adult on October 16, 2015 by D.M. Jarrett. 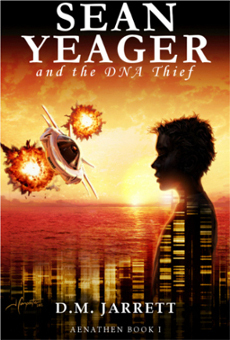 After months of crafting, designing, huffing and puffing… Sean Yeager and the DNA Thief is available in deluxe print! Hurray! Deluxe because it is a 6×9 inch book size which shows off the cover and makes it very easy to read. The DNA Thief sets the scene at breathtaking speed and Hunters Hunted is set to build on the mysteries and action in a big way. It’s a big milestone for us and very soon we’ll be speaking to libraries and bookstores about stocking the physical books. It’s funny there is something about holding print in your hand that makes a real difference…. Meantime, on with the series. Hunters Hunted is nearing completion and will see the light of day first as an e-book initially with print to follow. This entry was posted in adventure books, artemis fowl, author, book series, children's book, dr who, entertainment, fiction, film review, future of print, great books, great new book series, harry potter, james bond, men in black, middle grade, percy jackson, promotion, publishing, sean yeager, sean yeager adventures, self publishing, teen read, tween read, young adult, young fiction and tagged action, adventure book, book, book for boys, book news, book review, children's book, comedy, funny book, good book, good writing, great new book series, james bond, middle grade, mystery book, promotion, reaching readers, reviewing, sci-fi, sean yeager, teen book, tween book, writing, young adult on December 4, 2012 by D.M. Jarrett.